They cancelled the flight because the pilot was sick. آنها به دلیل بیماری خلبان پرواز را کنسل کردند. The official report into the accident says that it was caused by pilot error (=a mistake by the pilot). 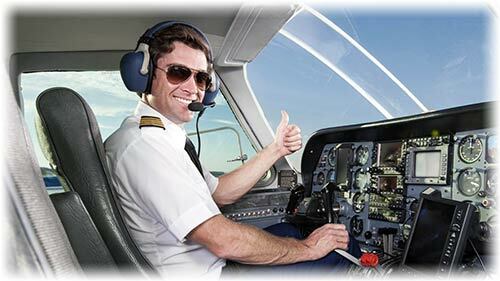 ▪ pilot someone who operates the controls of a plane: an airline pilot | He has a pilot’s licence. ▪ co-pilot a pilot who shares the control of a plane with the main pilot: The pilot became ill, and the co-pilot had to land the plane. ▪ captain the pilot who is in charge of an aircraft: This is your captain speaking. We will be arriving at Gatwick Airport in approximately 10 minutes. ▪ the flight crew all the people who work on a plane during a flight: The flight crew asked for permission to land at Chicago’s O'Hare International Airport. ▪ the cabin crew the people whose job is to serve food and drinks to passengers on a plane: The cabin crew will be serving drinks shortly. ▪ flight attendant someone whose job is to serve food and drink to passengers on a plane: The flight attendant told him to go back to his seat. ▪ steward/stewardess a man/woman whose job is to serve food and drinks to passengers on a plane: I asked the stewardess if I could have a blanket. • The accident was caused by pilot error. early 16th cent. (denoting a person who steers a ship): from French pilote, from medieval Latin pilotus, an alteration of pedota, based on Greek pēdon ‘oar’, (plural) ‘rudder’. • The air crash is thought to have been caused by pilot error. • The aircraft was set on automatic pilot. • The pilot bailed out as the aircraft crashed into the ocean. If you'd seen the pilot, you'd know why they decided not to make a complete series of programmes! ...fighter pilots of the British Royal Air Force. A pilot is a person who steers a ship through a difficult stretch of water, for example the entrance to a harbour. A pilot scheme or a pilot project is one which is used to test an idea before deciding whether to introduce it on a larger scale. A pilot or a pilot episode is a single television programme that is shown in order to find out whether a particular series of programmes is likely to be popular. A pilot episode of Nothing’s Impossible has already been filmed. 1 : a person who flies an airplane, helicopter, etc.